Recently I was working on a strange problem faced by a development team.They had used .NET 2.0 Lightweight Transaction Manager provided by the classes under System.Transaction namespace.Within the TransactionScope a long running database job was executing.They faced an intermittent TransactionAbortedException saying “Transaction has been aborted”. After taking a look into the code it was found that they are using a ADO.NET Command Timeout of about 900s.But there is no command timeout set for the Transaction.The default timeout period of Transaction is 60s.So there can be a situation where the database job is taking more than a minute to complete and Transaction Manager is aborting the transaction as transaction timeout has expired even though database process has not timed out. 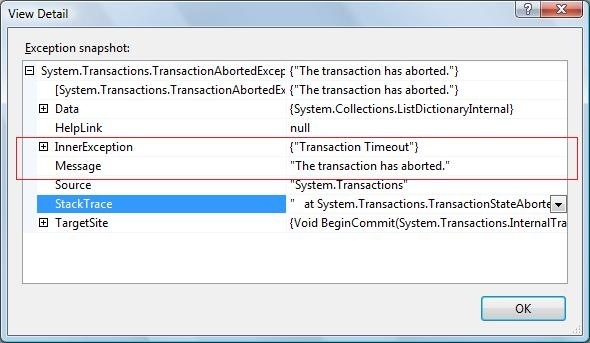 We can set the Transaction timeout in two ways using the constructor of the TransactionScope class or config. The following two constructors of TransactionScope class accepts a TimeSpan parameter which defines the timeout period for the code executing within the context of that TransactionScope. Here I have set transaction timeout 30 s and the code block will take 60 s to execute. By transaction we mean a group of tasks which are executed together.If anything goes wrong in any one of them then outcome of the entire set is rolled back.After rollback the system returns to it’s original state i.e. the state before execution of transaction started.Changes are only committed if all the tasks are completed without any problem or failure. Atomic – This describes the all or nothing feature of transaction.For example a transaction in document upload may contain two steps saving the file in server disk and inserting a record for the document in database.Here the transaction will be successful if both file and database record is successfully saved,if there is a problem in any one operation none will be saved. Consistent- Transaction should always leave the system in consistent state.Think of the above example if the database record is saved and file is not then the system would have become inconsistent having metadata for document whose actual file is missing. Isolated-Transactions has to operate in isolation until they are complete.For example when the file is not saved yet,database record for document is saved and it is visible to other users in document list screen.Other user might click that link to find that no file is attached and it will appear like a phantom record. Durable-No information should be lost even if the machine goes down when a transaction is executing. A transaction when involves multiple persistent resources(e.g. databases) or spans across process/machine boundary is referred to as a distributed transaction. Transaction Manager – A transaction manager manages commit/abort and monitors status of each task by coordinating with the corresponding resource managers. Resource Manager – A resource manages state of a particular resource based on the instructions from the transaction manager. Each resource manager responds whether they are about to commit or abort. Coordinator collects the responses and decides whether to commit/rollback the transaction as a whole. In a distributed transaction spanning across multiple server each server has a local transaction manager and all resource managers in that server enlists with that local transaction manager.The local transaction managers in turn communicate with each other.There is superior/subordinate relationship between each local transaction manager and the corresponding resource managers in that box.The local transaction manager of the server where the transaction is initiated is called root transaction manager or the global commit coordinator.So this is the root of the commit tree and the enlisted resource managers and other local transaction managers are it’s children.Each resource manager depends on it’s local transaction manager for commit/abort decision and each local transaction manager depends upon it’s superior transaction manager (if any) for the commit/abort decision. The transaction manager maintains a log on disk. The log is a sequential file with transaction events. The transaction manager records transaction starts, enlistments, and commit decisions in the log. During normal processing, the transaction manager only writes to the log. However, if the transaction manager fails, it reads the log when it restarts to reconstruct the most recent state, using the log to make its state durable.